We had some good responses, and everybody was right on. This is an image of Herpetic Whitlow. Herpetic whitlow is an infection of the digits caused by herpes simplex virus (HSV). It can be caused by HSV 1 or two. The common pathophysiology is inoculation of the affected area through a break in the skin and subsequent exposure to bodily fluids. 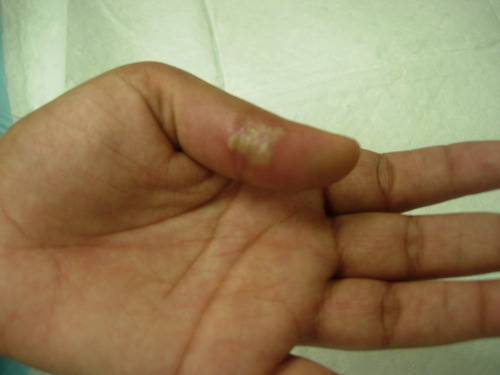 Patients present with a complaint of intensely painful lesions on the digits, usually at the distal phalanx. A prodrome of severe pain is followed by eruption of vesicular lesions. The prodrome may include pain felt in the upper arm or axilla as well. The lesions appear as classic HSV, grouped vesicles on an erythematous base, and may coalesce, as in this case. This is a self resolving illness, and usually will improved within two weeks. Treatment is symptomatic care with analgesia, although in the immunocompromised, oral antivirals should be considered. In children and healthcare workers, infection is usually secondary to oral HSV infection (the classic buzzword is a dental hygienist or dentist), while in adults exposure to genital HSV is more common. The big take home: do not attempt to incise and drain these lesions. Doing so may lead to bacterial superinfection, delayed healing, or, the more feared complication, systemic spread. You wouldn’t want to be the one who caused herpes encephalitis, would you? For a more detailed overview, check out this well done Medscape article.